Mr. James Caldwell, ship’s mate killed by two balls entering his back. The first causalities of the American Revolution. 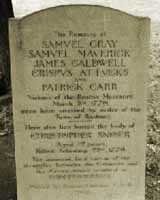 Of the five who died in the Boston Massacre, James Caldwell was one of three who died instantly. 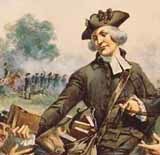 Appointed by Continental Congress as a chaplain in the patriot army, preaching on Sundays and leading his men into battle during the week; He was an active partisan on the side of the revolutionaries, and was known as the “soldier parson.” His church and his house were burned by Tories in 1780. 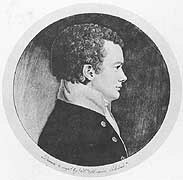 From late 1801 into 1803 Lieutenant Caldwell was an officer of the frigate Constellation during the initial phase of the war with Tripoli. In mid-1803 he returned to the Mediterranean in the brig Siren to participate in further operations against that piratical North African state. 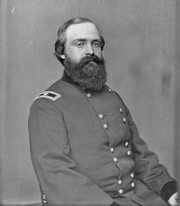 Caldwell’s bloodiest combat experience was at the Battle of Gettysburg on July 2, 1863 and conducted the largest Union assault of the three-day battle. After the war, he served in the honor guard for Abraham Lincoln’s funeral train. Army Spc. Nathaniel A. Caldwell, 27, of Omaha, Nebraska was responding to a civilian call when his vehicle rolled over in Baghdad, Iraq. Caldwell was assigned to the 404th Air Support Battalion, 4th Infantry Division, Fort Hood, Texas. He died on May 21, 2003. 38, of North Providence, R.I.; assigned to the 115th Military Police Company, Army National Guard, Cranston, R.I.; killed Sept. 1, 2003 when his vehicle struck an improvised explosive device south of Baghdad, Iraq. Sgt. Caldwell was one of two soldiers killed in the incident.